On the first day of the subcommittee hearings, the Assistant Secretary of Health, Education, and Welfare (HEW), James M. Quigley, made comments that seemed to place the administration at odds with Muskie and S. 306. Quigley declared that the proposed controls were premature, that current federal authority was adequate, and that “we do not recommend enactment of regulatory legislation at this time….” This letter from S. Smith Griswold, California Air Pollution Control Officer, expressed his alarm over Quigley’s remarks and urged Muskie to push ahead with strong regulation. Quigley returned to the subcommittee hearings to clarify that he was only objecting to S. 306’s detailed standards and aggressive timeline to implement emission controls. United States. Congress. Senate. Committee on Public Works. "S. Smith Griswold to Edmund s. Muskie Regarding S. 306." S. Smith Griswold to Edmund s. Muskie Regarding S. 306, April 16, 1965; “S. 306, Miscl. Corresp. 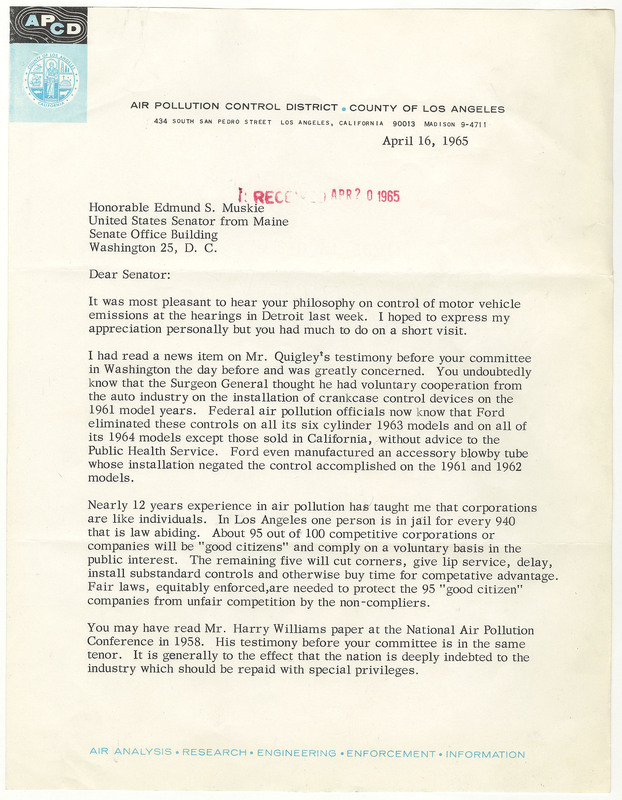 Re air pollution” folder, Legislative Files, Box 3; Committee on Public Works; 89th Congress; Records of the U.S. Senate, RG 46; National Archives.. Accessed 19 April 2019. http://acsc.lib.udel.edu/items/show/325. S. Smith Griswold to Edmund s. Muskie Regarding S. 306, April 16, 1965; “S. 306, Miscl. Corresp. Re air pollution” folder, Legislative Files, Box 3; Committee on Public Works; 89th Congress; Records of the U.S. Senate, RG 46; National Archives.